Posts tagged "Kellogg School of Management"
But when Meghan Busse, Duncan Simester and Florian Zettelmayer, academics from MIT and the Kellogg School of Management, investigated they discovered a curious anomaly. In the previous weeks the car companies had been cutting prices so much that the employee discount was generally no better and occasionally more expensive, than existing deals. The academics hypothesised that it was the price cue, not the price, which mattered. Consumers reacted to the plausibility of the deal rather than the actual discount. 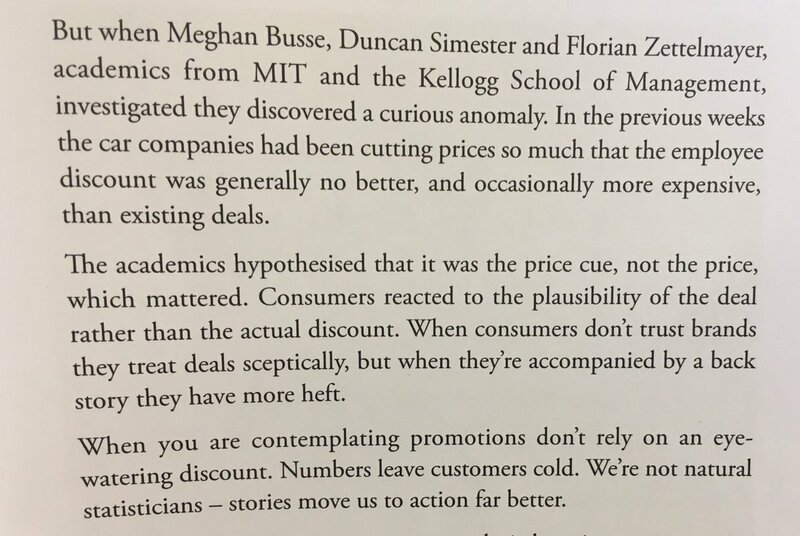 When consumers don’t trust brands they treat deals sceptically, but when they’re accompanied by a back story they have more heft. When you are contemplating promotions don’t rely on an eye-watering discount. Numbers leave customers cold. We’re not natural statisticians – stories move us to action far better.